President Maithripala Sirisena, Prime Minister Ranil Wickremesinghe and the National Government have repeatedly assured they would prevent wasteful expenditure, luxuries or extravagance – especially if they was at public expense. In line with this principle, we thank the government for cancelling a plan by Ports and Shipping Minister Arjuna Ranatunga to build the world’s tallest Christmas tree at the Galle Face Green. The Minister became a national hero when he led Sri Lanka to win the Cricket World Cup in 1996. Now it seems he wanted to find a place in the Guinness Book of Records by constructing the 300-foot tall Christmas tree, going higher than Mexico’s record of a 295-foot tree. On Tuesday, the Catholic Bishops Conference of Sri Lanka (CBCSL) held a media conference, where Cardinal Malcolm Ranjith made a fervent plea to the government that it should stop this move to build this extravagant Christmas tree. The Cardinal, who is also the Archbishop of Colombo, urged that this money be used to build houses for the poor or offer educational scholarships to poor students. We commend this appeal by the Catholic Bishops and thank the government for acting fast to prevent what most people see as a further commercialisation of Christmas which has today been turned into a virtual business. Last week, the National Christian Council’s General Secretary Rev. Ebenezer Joseph also urged that the construction of this tallest tree should be stopped, comparing it to the notorious tower of Babel. The Minister also claimed his intention was to promote Buddhist-Christian harmony. But it appears he needs to be educated or enlightened on better ways to do this, without crucifying Christ. Instead of such tall stories it would be much more effective and lasting to go green for this festive season by taking practical steps, small or big to curb climate change. With the national government also declaring that 2017 will be the year of poverty alleviation, there is also a need for the people to observe the oncoming festive season in a simple and humble way. This hallowed tradition dating back to thousands of years in Sri Lanka is known in classical Sinhala as “alpechchathawaya”. The opposite of this is known as “bahu-banda-vaadaya”, wanting or desiring more and more, irrespective of whether we need them or not. Some unethical marketing practices are also seen to be rampant with one slogan asking the people to “bring out the child in you”. Becoming like a child is good if it means growing in innocence, devastating honesty and keenness to learn, but we should not kid ourselves by thinking that to become childlike means to buy whatever we want or desire and whatever looks attractive. The Media Minister recently proposed to the Cabinet and has called for public representations for the setting up of an Independent Media Regulatory Commission to maintain ethics and standards. It may be necessary for such ethics to apply to marketing practices also so that the people will not be misled by false or bloated claims. 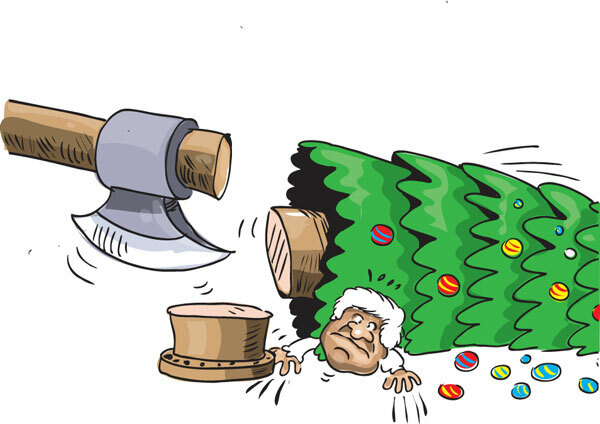 When the axe falling on this tallest Christmas tree we hope it will be a lesson to political, religious and social leaders that if they wish to build a new Sri Lanka based on simple and humble values, the leaders need to let their lifestyle be the example instead of preaching what they do not practise otherwise in a figurative sense, if a tree does not produce good fruit, its branches will be cut and thrown into the fire.